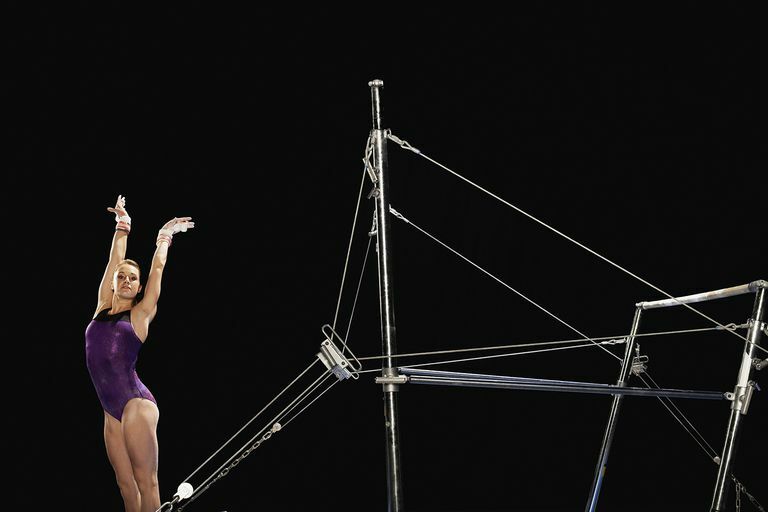 When a gymnast lands a tumbling pass, vaults or dismounts without moving his or her feet, it is called a stuck landing. Although the flips and tricks tend to be the biggest crowd-pleasers, the landing is also critical to a quality gymnastics performance. It's the last thing the judges see after a routine. Every gymnast aims to stick when he or she lands. If gymnasts move their feet at all, it is a point deduction. On floor exercise, men are expected to stick their tumbling passes, while women are allowed to take one step back into a lunge without a deduction. Sometimes, competitions can be won or lost by the competitors' landing. Even a tiny step can blow an otherwise excellent routine. Conversely, an underdog gymnast can rise to the top with perfect landings. Beyond just earning you points, a proper landing has a function. It keeps gymnasts safe. Repeatedly landing improperly can put gymnasts at higher risk for injuries, even tears. Absorbing the force as you land reduces the jolt on the joints and proper form keeps the body in safe alignment. This is also called sticking the landing, or stick. Here is a video montage of some excellent stuck landings. Practice your landings every day. Practice your landing by jumping off of a raised step or platform. When you have that down, move up to a higher platform or block. Try jumping off a platform with a tuck jump, half turn, full turn, and other moves. Make a game out of your stuck landing drills. See how many you can get in a row or compete with friends. Do regular strengthening and mobility exercises, such as ankle circles, side planks, glute bridges, lunges and more. These will help your landings, too. Work with your coach to improve your landings. As for a personalized analysis of your technique and alignment. It can help improve body awareness to record your landings and watch them yourself, too. Don't overlook this crucial part of the sport.